Full double page from previous promo. Looks like OCE Neptuneman confirmed as well! The Sunshine hype is real! Silverman will also be a must-have, but I'm still resisting the OCE versions. I might get Akuma Shogun if he is affordable, but we'll see. Still haven't managed to get Strong the Budo (didn't want to basically buy Big the Budo again, although now I'm regretting that). What are the odds we'll get another Strong with Enma's real face underneath? Seems like a longshot since the figure is newer and the line is already nearly half recolors of some sort, but it would be nice. Enma's got a neat design that we barely got to see in-story, so a figure of him would be nice and unexpected. Anyway, I'll keep an eye on this post for pre-orders. I need that Sunshine yesterday! Those aren't pages confirming anything. I didn't elaborate when I was mentioning the dates on those magazine scans because I hadn't done the research, but they're old magazine scans, not new ones. They're talking about Tamashii event coverage from November 2016, using images of the figures that were on display during the event and detailing information on them, but the magazine scans are also from 11/2016. They're not saying these are figures going up for preorder - though Strong the Budo, Brocken Jr. OCE, and Ashuraman OCE were, for those that wanted them thankfully. Edited by BaltanII, 30 August 2017 - 10:18 AM. So finally after month of neglect I was able to update my display! What do you think? No idea where Budo and Terryman will go. Think Terryman will go in an Ashura Buster and Budo in a hells guillotine! I've just ordered another blue and red ring corner, but there's not enough room on the shelf. Never expected this would become a double shelf collection! Edited by Kanji, 10 September 2017 - 02:55 AM. My favorite SHF Suguru. Still feel like there are too many of them. The OCE with the white trunks on the way is... disappointing. Especially when there are so many other costumes they could use if they really have to keep releasing him. I'd trade em all for just one Sunshine! Too right! 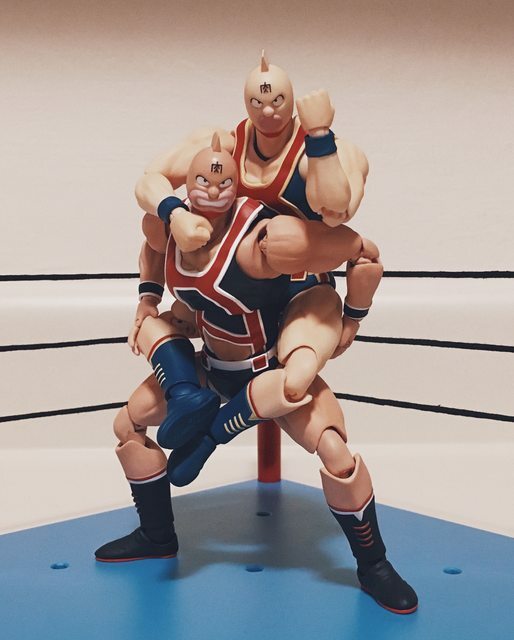 I'm constantly looking at Kinnikuman Great's torso and imagining how simple it would be to repaint it red and stick it on Suguru to make a Dream Tag version. Then I can finally setup an accurate Muscle Docking display! I refuse to do it with the current version. As far as future characters. It would be great to see Wolfman along with the 4 Seigi's currently duking it out! Curry Cook, Teapackman, Benkiman and Canadianman would all make great figures! Before that of course we need the 4D Killer combo of Black Hole and Pentagon and of course some more SFTT representation with Super Phoenix, Mammothman and Omega Dexia. Finally, I wouldn't complain about getting more devils after Sunshine. Sneagator or Atlantis would probably be the top of my list!! Call me crazy, but i'd also like this fella! Edited by Kanji, 11 September 2017 - 11:09 AM. No, you're probably thinking of Romando. Definitely hasn't been a King 100 Ton in the line yet. Yeah, what Baltan said. Romando made a King the 100 ton along with almost 100 others a long time ago, but they closed down and stop manufacturing years ago. This new line is from Bandai. They'v e only released about 20, so I'm afraid we have a long way to go before they reach the likes of MoaiMan! Lol Lets just get Sunshine and Black Hole first! Hah, knowing Bandai/Tamashii Nations, they will never complete any lines, but I will let you dream, my friend lol... just don't cancel Sunshine! Not as daring as painting them, but it adds variety when you lack the talent/skill/balls to take a brush to them. Also, where is Terryman? He still coming this month or did I miss the memo of a delay? Nice idea with swapping those arms! I really like it! Might have to consider that myself! Not delay on Terryman. He was confirmed for a September 30 release date. so only a couple of weeks to go! Also, my Strong The Budo finally arrived today! Expect pictures soon!! As promised! Strong vs Shogun in all their glory! I think I may just be able to squeeze Terryman in, but then I'm done! 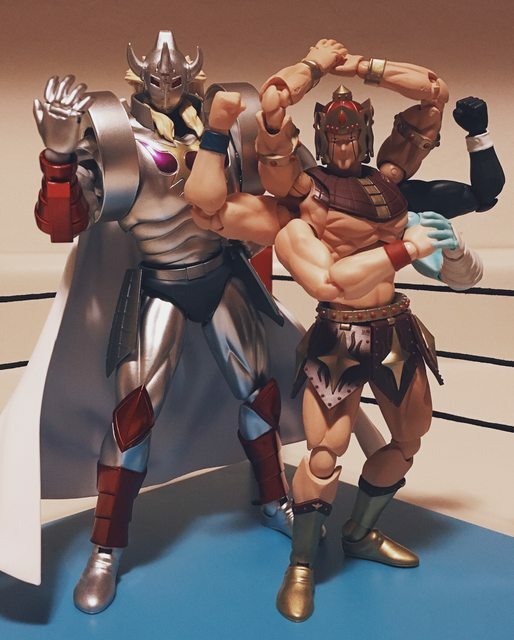 I already have more Kinnikuman figuarts on display than anything else! I HATE HATE HATE! Build a figures with a passion but that Meat idea is fantastic. I really like this line of figures. A coWorker started me down this road by picking up the Buffalo man for me while on a trip to JPN. 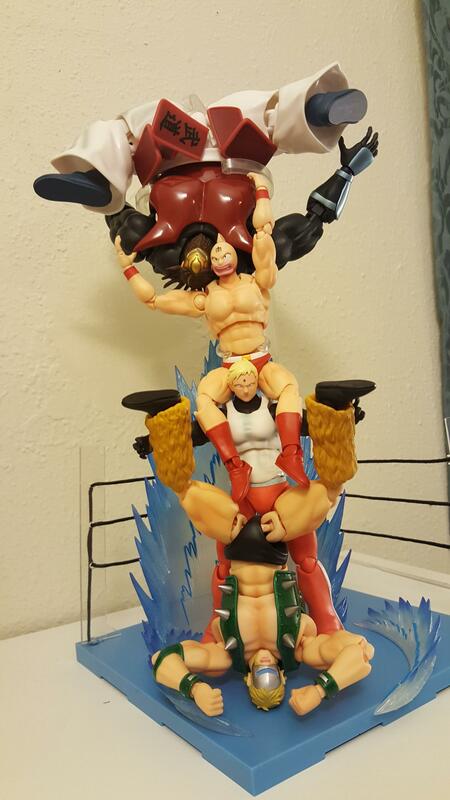 Subsequently I've picked up Akuma Shougun, Kinnkuman Soldier, a Body Kun, and a red corner but I've slowed down (ever since the same coWorker picked up a Big the Budoh and experienced a lot of problems with that particular figure). I've been putting my SH Fig $$ towards their Ultraman line instead (grew up on it). 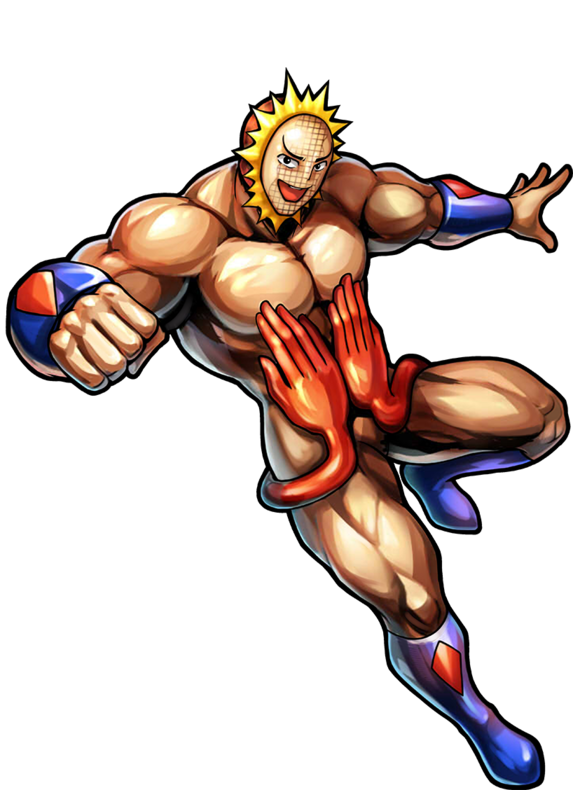 I've thought about picking up a Kinnikuman Nemesis and possibly a Silverman but I want to read those mangas first. Anyone have a good place to read scans of Nisei (I have all the ones up until Kevin Mask wins the Olympics)? Edited by theCrazyest, 25 September 2017 - 03:39 PM. Crazyest, you could always buy the actual shonen jump advanced manga books that were released. They go all the way after the Olympics and Kevin Mask's victory. I collected them all and I'm pretty sure you can get an english copy. I'd be interested in getting those I was collecting the VIZ releases until I couldn't afford to (out of work). BTW how far does the VIZ run cover? Did BaMco fix any of the issues that the Big the Budoh figure had when they released Strong the Budon or is it just basically a repaint? I think Sunshine SHOULD come with a bunch of accessories but as the BaMco tend has been with SHFigs it probably won't unless they release it as a webshop exclusive. If they ever decide to make a Kevin Mask and Chloe I might have to pick them up. Edited by theCrazyest, 29 September 2017 - 07:41 AM. What are the issues you're talking about with Big the Budo? I own one and can't think of any. First off the SHFig Big the Budoh's a great LOOKING figure, if you want to have it standing or any straight legged pose it was all good. My coWorker had really high hopes since it was the first Tamashii web exclusive and he's a huge fan of the Hell missionaries. He only decided to get it after he became super impressed with the range of poses I could pull off with my SHFig Buffalo man, as well as Kinnikuman Soldier, and was floored by the Yoga pose that I have my Goldman/ Akuma Shougun in currently. Unfortunately my coWorker's Budoh was unable to hold a dynamic pose very well on his' own (too light) and he is uneasy to pose as well; also there are some really bad gaps that were left by some of the poses. My coWorker wanted to put him in a "Super Kick" pose (modeled after CIMA's sidekick) since I had Ataru in one at the time. In order to get the head in a pose that that my coWorker wanted we had to remove the head and move the ball/hinge around until it was in the approximate location before putting back on the head and then positioning the head. His particular figure had really tight knees (mostly due to paint issues) that we had to work really slowly and repeatedly so it didn't break the joint. Conversely it's legs liked to pop off at the hip joint a bunch (super loose) and made his legs flop around like wet spaghetti so we had to do the super glue trick to get more surface area so it could hold a pose (which only happened after repeated applications of super glue); otherwise the leg would NOT stay at the desired angle. Budoh is also unable to do any really wide poses since the shape of the Hakama does not allow for the full use of the feet (ankle rocker) in wide legged poses. We tried a running Cross Bomber (with Budoh charging at Neptuneman from stage right to stage left) and legs did not cooperate since they would shift under the weight of the figure and mistakenly since we are looking at Budoh from the back multiple parts of it's back displayed gaps since he's leaning in to the move and running. To display free standing Budoh in the most flattering pose possible we ended up putting him in pretty much a straight standing position (facing slightly to the left) with it's feet slightly spread apart and pointing the shinai (pointing to the left) while Neptune man was placed in a horse stance facing slight to the right with a microphone in his hand (not sure where he got the mike from but it looked suspiciously like one that might come with a Barbie due to the weird thin C clamp on the outside) using his free arm to point off to the right (like he was challenging the crowd). My coWorker kept them at his desk for a while but was never quite happy so he ended up taking the SHFigs down and putting up the Medicos cross bomber trading figure in its place. Edited by theCrazyest, 29 September 2017 - 12:37 PM. So besides the repaint and new head is the S H Figuarts Strong the Budoh any different from Big the Budoh? In terms or articulation? Nope. Both figures are pretty much the same. I get what ybare saying re posability. I never expected the bigger figures to have the range the smaller one did though. I'm quite happy with how mine is posed with with Shogun personally. The Manga ran to 29 Volumes. The last battle was Shivano (Ashuraman's Son) vs Kid Muscle. It was a redemption battle for Mantaro. Accurate. 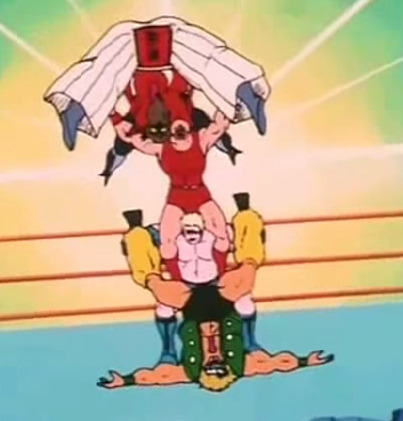 But I believe it was Ashuraman himself that was the leader of the Demon Seeds (villain group) and Kid Muscle's foe.